Annually, the World Day of Remembrance for Road Traffic Victims (WDoR) is commemorated on the third Sunday of November – to remember the many millions killed and injured on the world’s roads, together with their families, friends and many others who are affected. It is also a day when we thank the emergency services, medical professionals, police and those who are daily confronted with the dramatic consequences of road crashes. 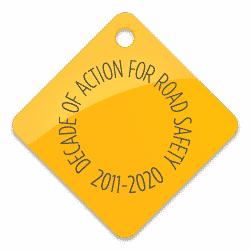 In 2018 the theme and slogan of the #WDoR 2018 is “Roads have stories”. “That message was not so important…”. Similar activities were also organised in Comrat, Gaguzia and will be carried on in the Northern part of Moldova. 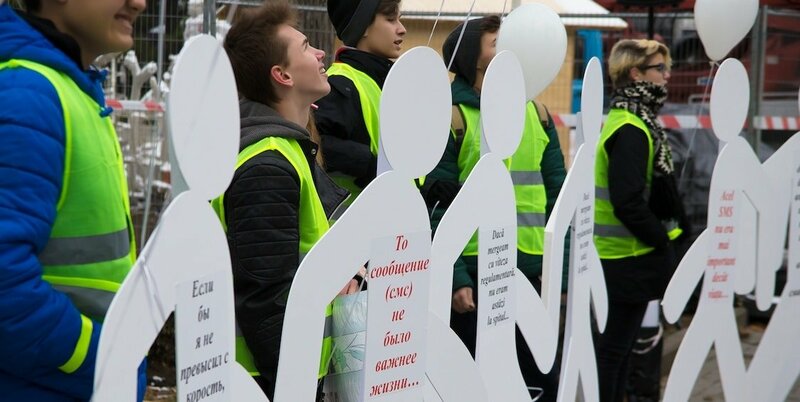 On November 19, the ACM, under the aegis of the World Health Organization in Moldova, and in partnership with the National Patrolling Inspectorate organised a round table to discuss the most serious road safety issues and identify new solutions to reduce the number of victims at a national level. The event was attended by the representatives of the Ministries of the National Road Safety Council; international organisations such as the WHO, EBRD, and UNDP; driving schools such as Driver Plus School, UCA; private sector organisations such as Orange, and finally NGOs including the Oratorul Theatre, MOTIVATION, Neovita, the National Environmental Center, and Mama.md. The main issues addressed in the agenda were child injuries and deaths; the safety of streets and intersections; pedestrian safety, mobility and access; and safe, green and sustainable cities. The Head of the General Police Inspectorate, Alexandru Pînzari, highlighted the importance of complying with road traffic rules, noting the main causes of road traffic crashes: excessive speed and drink-driving. The Chief of the National Patrolling Inspectorate, Livii Baziuc, followed with a presentation on the current road traffic situation in Moldova and called on every road user and community representative to join the national road safety measures and interventions in order to save lives on the road. At the same time, the event presented an opportunity for people to share their own tragic road stories and society’s attention to the dangers of the road. 12 years ago she was a victim of a serious road crash with a very long recovery period but with a happy ending. She shared her own realisation, that only after this accident did she understand that safety is a priority for the sake of life. She took the opportunity to thank the extraordinary team of doctors and surgeons who saved her life and offered condolences to those whose stories have ended differently. Denis, just 31 years old, was left paralysed five years ago because of a drunk driver and now uses a wheelchair. His story was told by Victoria Boţan of the NGO MOTIVATION. Ms. Boţan demonstrated the reality of how people with special needs live, and shared the difficulties faced by people with disabilities every day. It is Denis’s hope that accessibility in Moldova will be improved for those citizens facing problems due low level of mobility. The solutions do exist. They just need to be applied. And the ACM is working to promote equal rights for people with disabilities in the hopes that in the very near future their needs will be heard by the responsible authorities and their lives will be made better and easier. In addition, urbanist and civic activist, Victor Chironda, together with Simion Berzoi, UNDP Project Coordinator, and Ion Cozma from Orange Moldova presented on the cost-efficient and modern possibilities of road traffic management and cities with streets built for people rather than vehicles. They called on local public authorities and other relevant organisations to look at innovative solutions and new technologies can and should be used to transform Chisinau into a green, safe and sustainable city. The ACM would like to express their gratitude to all the participants who supported them in organising the #WDoR2018 and in achieving their main goal – safe and accessible roads for all – the World Health Organization, the Ministry of Health, Labor and Social Protection, Ministry of Education, Culture and Research, the General Police Inspectorate, the National Patrolling Inspectorate, General Inspectorate for Emergency Situations, State Chancellery, Ministry of Economy and Infrastructure, European Bank for Reconstruction and Development, the UNDP Program, the “Oratorul” Theater, “Driver Plus” school, UCA Union, Mama.md, “Neovita” Center, MOTIVATION Association, National Environmental Center, Mr. Victor Chironda,”Orange” Company.